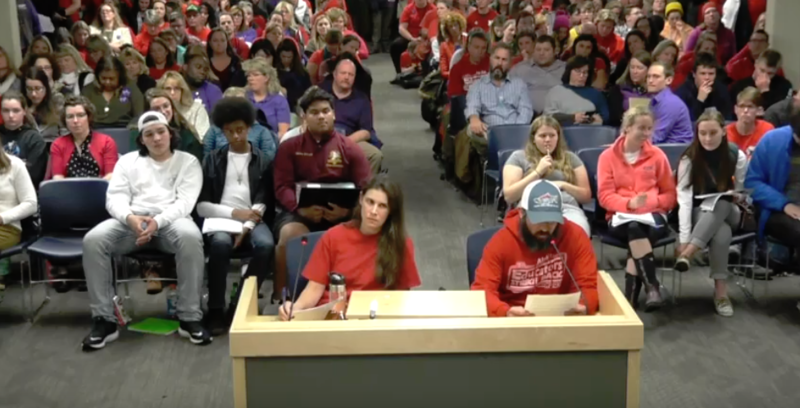 Unhappy teachers staged a demonstration at Monday’s Anchorage School Board meeting, upset about curriculum changes and wages, among other things. The meeting was packed with educators dissatisfied with the current contract negotiations between the school district and the union. Gruening Middle School teacher Kadra Peterson urged the board to step in. Following Peterson’s testimony, 300 to 400 educators — by her estimate — walked out of the meeting. Peterson says the group’s main point of contention with the district are curriculum requirements introduced at the elementary and middle school level that she says restrict teachers to “scripted” lesson plans, and add workloads to teachers while sacrificing time spent with students. ASD deputy superintendent Mark Stock disputed claims that the “priority plans,” as Stock called them, were restrictive and scripted. He said that the district implemented new, more descriptive lesson plans to help increase academic performance — particularly reading — among elementary school students. Teachers say they want more academic freedom. The contract negotiations have also been stalled due to the large difference in wage proposals between the two groups. The teachers wanted an increase that Stock says would cost $54 million. The teachers say their current pay isn’t competitive. The teacher’s union and district began a second round of mediation Tuesday and will continue Wednesday. The two other topics of discussion that drew testimony involved the potential closing of JBER-based Mt. Spurr Elementary and a proposed French language immersion program at O’Malley Elementary. Both topics are scheduled to be voted on at the next board meeting on November 19th.